Directions: From Morehead at US-60 & Rt. 32 (at Rodburn), go east 10.8 miles on Rt. 32 (first on Christy Creek Road then continuing on Brown Ridge Rd). Barn is at right side of road. Hung: December 7, 2006 by Grayson RECC Employees David Holbrook and Joe Sargent with help from quilt trail volunteers Billy and Carmileta Evans. 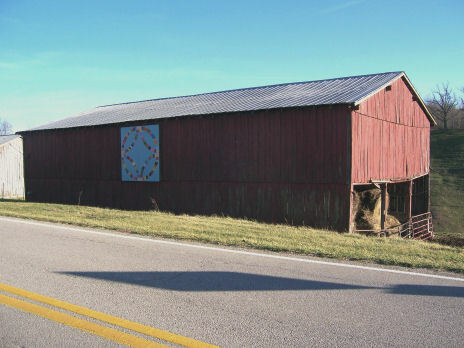 Notes: Barn is adjacent to the highway and can easily be seen from both directions on Rt. 32. It is located on next farm just past Barn Quilt #21 and is only a short distance from the Elliott County line. 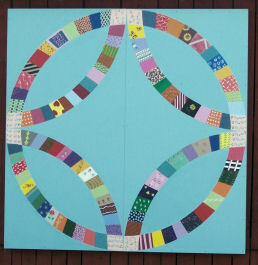 *The double wedding ring pattern has long been a favorite among quilters. It was especially popular in the United States during the 1930s and 1940s.